Whether you’re buying or selling a home and want to install attractive new screening, or you have rips and tears in existing screening that are beyond a little patch-repair job, you can easily install new screening on your own without having to call in a professional. Backed by more than 60 years of innovation and excellence in insect screening, Phifer offers installation kits to make your next DIY project a breeze. We also know a thing or two about DIY installations ourselves and want to share some tips for quick and easy installs for window, door and patio screening. 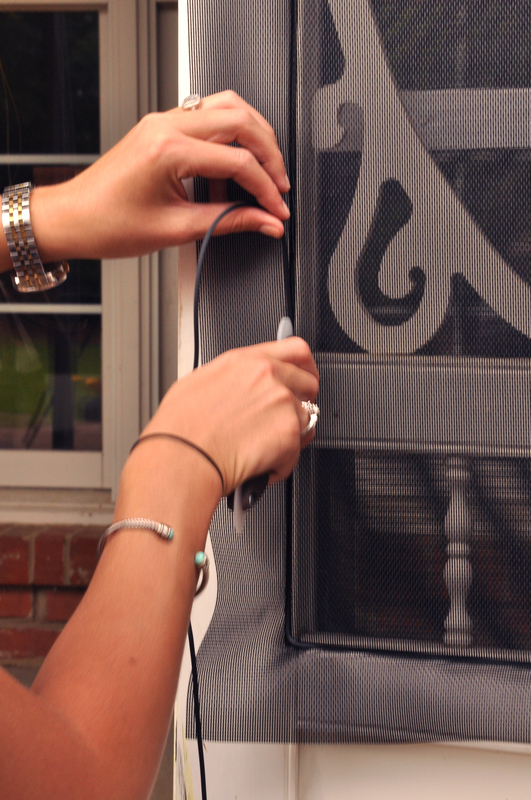 When your window screen has a tear that’s too big to mend with a small patch of replacement screening, you’ll need to remove your old screen and replace it with brand new screening. Here’s how! When replacing your screen, place your screen frame on a flat surface and remove any existing spline and the torn screening. Tape the outside edges of the frame to the flat surface, being careful not to put tape over the spline groove. Unroll the 36” x 84” (91.4 x 213.4 cm) roll of screen over the frame. Lay screen fabric over frame, align squarely and overlap 1/2” (1.3 cm) on all sides. Using the spline roller tool, begin adhering the screen fabric to the frame with the spline by rolling the fabric into the screen frame groove. Be sure to hold the fabric straight while rolling. Press the spline securely into the groove, taking care to secure the spline in each corner of the frame. You may need to push the spline into each corner using a screwdriver or gently using your utility knife. Using your utility knife, trim any excess spline and screen from the frame. Make sure that you cut toward the outside edge of the spline groove to prevent damage to the newly-installed screen fabric. For more tips on replacing screening, check out our video tutorial. Installing new screening on a door in your home isn’t that much different from installing new window screen. We’ll walk you through the process and outline the tools you’ll need for an easy, breezy install. Remove the damaged screen from the door frame. To do so, simply remove the spline from the edges surrounding the screen and your old screening will easily fall away. If you’re having a hard time removing the spline, you can use your utility knife to help remove the spline. Next, make sure that your door is secure so that it doesn’t move when you’re rescreening it. 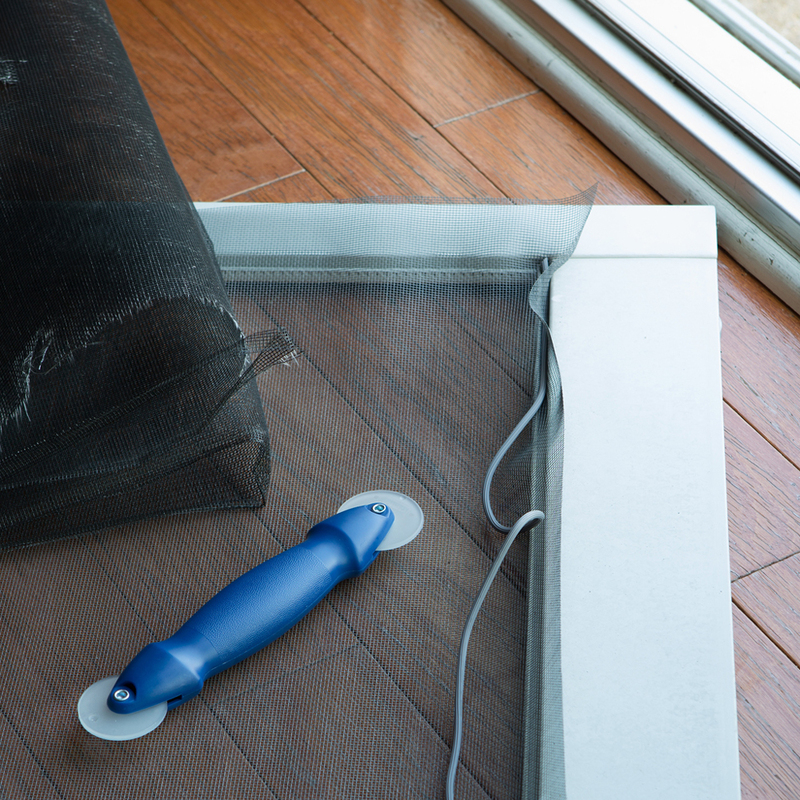 Unroll your screen and determine how much of the roll you will need to use to rescreen the door. Leave a few extra inches on all sides to make sure you have the right amount. Use your scissors to cut the screen to your ideal dimensions. Make sure your screen is straight and use your spline roller to push the spline over the screen and into the spline groove. Make sure the spline goes all the way around the door into the spline groove. While using your spline roller, be sure to stretch your screen tightly to avoid wrinkled screen, or screen that flaps in the breeze. Once you’ve made sure your screen is tight and held securely in place by spline, use your utility knife to cut the spline cord. Then, remove the masking tape and cut off any excess screening from the edges. Check out our video tutorial on replacing screening on a door! Typically, replacing pool and patio screening is a two-person job. It’s not impossible to do it yourself, but it sure does go a lot faster when you have another person pitching in! Here are some tips for rescreening your pool enclosure or patio screening. A roll of screen [ranging between a 25’ (7.6 m) roll and a 100’ (30.5 m) roll, depending on your needs], a spline roller and flat T-spline. Pro Tip: For replacing pool and patio screening, be sure to use flat spline, instead of round. First, remove old or damaged screen. Use your pliers or utility knife to release an edge of the spline and pull it out of the frame. If there are multiple pieces of spline securing the old screening in place, repeat the process until all of the spline is removed and the old screen can easily be lifted off of the structure. Your patio or pool cage likely has multiple panels that will need to be screened. Use your tape measure to measure the openings of each panel by placing the end of your tape measure along the outside edge of the spline channel, measuring down the length, then width of the opening. Once you have your measurements, add 2-3 inches (5.1-7.6 cm) to each side for allowance. Take your spline and use your spline roller to press spline against the screening material and into the groove. Stretch the screen tightly to ensure a firm application. Make sure the spline goes all the way around the opening into the spline groove. Repeat this process for all panels on your patio or pool cage. While the term DIY is a relatively new one, legions of homeowners have been making home improvements to make their homes more comfortable and beautiful for decades. Phifer has been proud to offer handy homeowners the screening they need for home improvement projects for many years -- and we don’t plan on going anywhere any time soon! Feeling inspired to rescreen that window or porch? Check out our DIY video library for more helpful tips for homeowners. Take our quiz or view our screening selection guide to find the right screening product for your next product. If you have questions, please contact us. We’d be delighted to speak with you online or via phone to help answer your questions and choose screening that will keep your home free from insects and work well with your lifestyle and environment. We’ll even help you find a location near you to find our products and purchase them in stores or online.